Many new investors are encouraged to go it alone. If you’ve read more than a few books on investment, you’ve found a general consensus that it’s important to figure this stuff out yourself. After all, professional advice and management could cut into your ideal annual yields by a percentage point or two. Much better, our advice-givers advise us, to hit the books and make amazing decisions all on your own. You’ll make more money this way. This may be true in a perfect world. But you and I live in the real world. Without lots of native intelligence, experience, and guts, it’s really difficult to make the kind of trades that make one very wealthy. Most of us need a hand while we learn the ropes. And this is what separates good investors from great. It’s easy to just buy a few ETFs and let them sit around till you’re old, but that buys you security, not abundance. If you are at all interested in becoming financially independent, preferably before you’re old and gray, you’re going to need a team, and an interactive broker or two. You can find such a broker in a lot of places. Www.binaryoptions360.com is one such place, where CEO Brad Addley communicates with his traders in a way that is always pleasant, transparent, and informative. Using expert advice as he offers, it’s easy for investors to “level up”, so to speak, a lot faster than they would on their own. The notion that one should not pay for advice is what I would describe as “survivorship bias”. Survivorship Bias is something you’ll hear coming from very successful people. Lots of people try to be successful, but few succeed. It’s not uncommon for those that succeed to feel that they are somehow chosen, worthy, or special in the way that the general population is not. You’ll hear celebrities very often repeat the phrase “follow your dreams”, because doing so worked for them. There are plenty of other people following their dreams who never got anywhere, but not for lack of talent or trying. “Don’t pay for Advice” is the “follow your dreams” of the investment world. Because some overachievers are able to attain great wealth through their hard work, ingenuity, and (more than anything else) luck, they think everyone else should do it the same way they did. Now, I’m not saying this strategy won’t work for some people. What I am saying is there is no shame in paying for management, insight, and interaction from professional traders, brokers, and mentors. It’s a great way for new investors to learn about the discipline they are committing themselves to, and many new investors would never succeed without taking advantage of this strategy. 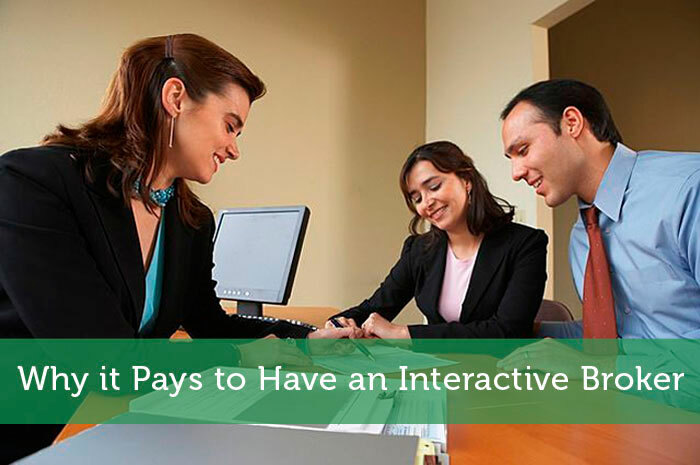 So the next time you see the phrase “Interactive Broker”, never fear. Helpful brokers are one of the ways we grow as investors. Not all of us can handle a lone-wolf, spartan investment existence. For us, it helps to have a listening ear and a source of insight. If you need help in your early investments, this is a great way to start. With an interactive broker, you’ll be more likely to be making more investments years down the road.